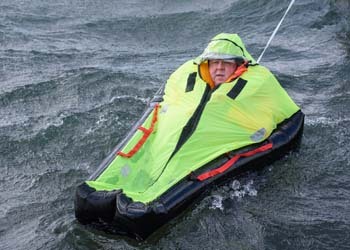 This liferaft is ideal for helicopter operators as due to its compact size. It can be stowed in a location that's easily accessible by the pilot or passenger in an emergency. The valise is manufactured from a Fire Retardant, Highly Visible and Gloss Lacquered Polyester Fabric. This fabric is resistance tested to temperatures exceeding -30 C/+70 C. This tough yet durable material protects the liferaft during both transportation and storage. Ultra compact design packed in a stowage valise with quick grab 'n' go single handle, which allows quick and easy access to the pack when time is precious. The operating lanyard is neatly stowed on the side of the valise where it is securely fastened to avoid inadvertent operation and the reflective strip along the length of the lanyard provides an aid to easier location in diminishing light. 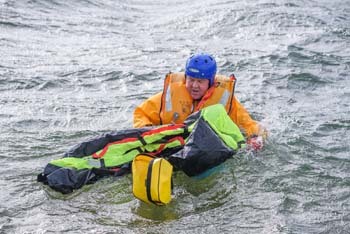 The operating lanyard and snaphook also act as a tethering line which ensures that the liferaft once inflated, cannot be accidentally separated from the survivor. 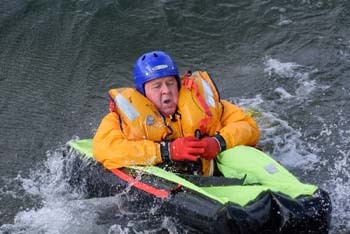 The single person liferaft is designed and manufactured entirely in the UK under the latest ISO 9001 approvals. Its proven design comprises of a gas inflated buoyancy chamber manufactured from lightweight durable fabrics, single layer canopy fitted with a splash guard. The advanced Dipped Floor seating lowers the centre of gravity resulting in enhanced in-water stability. 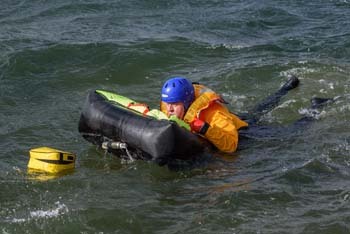 The liferaft is inflated using a disposable C02 cylinder which provides low cost maintenance due to it not requiring testing and refilling. Please Note: Survival equipment cannot be returned for refund. Please call us for further details.